The Ohio State University Comprehensive Cancer Center – Arthur G. James Cancer Hospital and Richard J. Solove Research Institute (OSUCCC – James) is one of four cancer centers involved in testing a new "nanomedicine" agent – known as BXQ-350 while in testing – in advanced solid tumors, including difficult-to-treat malignant brain tumors. BXQ-350 combines a protein called Saposin C, which is naturally expressed in humans, with nanobubbles of a fat molecule called DOPS. This combination creates a treatment agent that has the ability to selectively target cancerous tumor cells and then kill them, largely sparing the surrounding healthy tissues. These fat nanoparticles can also penetrate the blood brain barrier, which researchers say makes them particularly useful against malignant brain tumors. 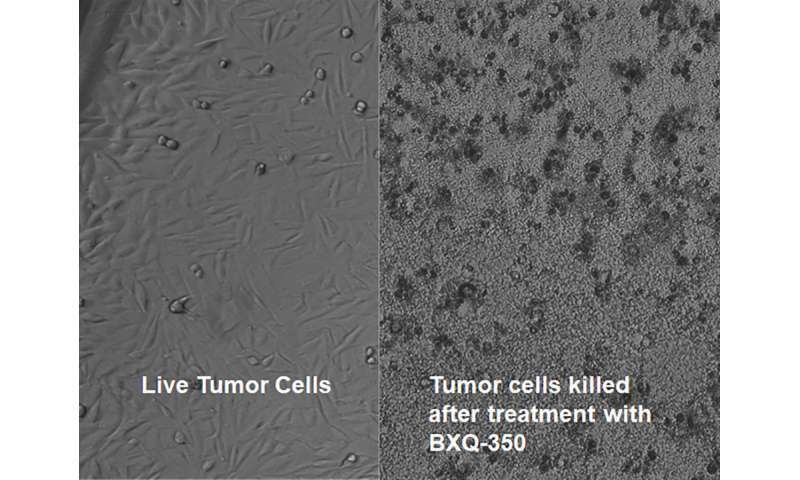 "BXQ-350 is the first agent in this class of drugs and has unique properties not seen in conventional cancer treatments. It is made of natural substances present in humans. Lab experiments have shown the agent has the ability to target cancer cells specifically and eliminate them," says Vinay Puduvalli, MD, director of neuro-oncology at the OSUCCC – James. "I believe that this research can potentially open new doors to the treatment of malignant brain tumors and other advanced cancers"
Recently reported clinical results from the phase I dose-escalation study show that the agent is well tolerated by patients; no dose-limiting toxicities have been observed, and no serious adverse events have been attributed to the therapy. The trial is accruing additional patients through an expanded phase IB trial, which is expected to enroll about 40 patients nationwide. Patients with malignant brain tumors and advanced solid cancerous tumors who have not responded to other therapies may qualify for this therapy. BXQ-350 is available as part of a clinical trial underway only at the OSUCCC – James, University of New Mexico Cancer Center, University of Cincinnati Barrett Center and University of Kentucky Markey Cancer Center. To learn more about clinical trials at the OSUCCC – James, visit cancer.osu.edu/clinicaltrials or call 1-800-293-5066.